Intermodal facilities and logistics parks go hand-in-hand. Volumes are increasing in the industrial sectors, while consumer traffic remains soft. Forsberg says BNSF also sees an increase in domestic intermodal business. “That serves to reinforce that this was the right long-term decision to make to put in a new intermodal facility,” Forsberg says. He is referring to BNSF’s intermodal project in Edgerton, Kan., 25 miles outside of the Kansas City metro. “When we began the project in 2007, intermodal traffic was 65 percent international; and today it is 55 percent international; 45 domestic,” says Patrick Robinson, executive director, The Allen Group, which is developing the 550-acre Logistics Park Kansas City, adjacent to BNSF’s 450-acre intermodal facility. The site is expected to become operational in the second half of 2013. “The shift in domestic intermodal is a real opportunity,” Robinson says. 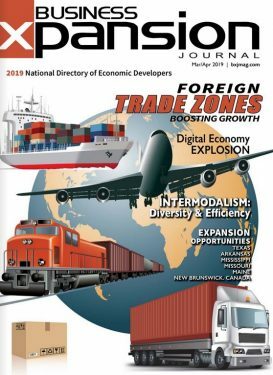 “Kansas City is the only place in BNSF’s network where they provide international intermodal, domestic intermodal and direct rail-service to buildings.” Some distribution operations have been struggling with the shift in flow from international to domestic. While the percentages will flow back and forth over time, tenants at the Logistics Park Kansas City will be able to capitalize because they have the opportunity to receive both, Robinson notes. The Logistics Park Kansas City in Edgerton is on property located between BNSF’s Chicago to Los Angeles route, which is one of the busiest rail routes in the country, with connections to the Southwest and the Midwest, Forsberg says. BNSF will invest $250 million in the Kansas City intermodal park’s initial construction, and plans a 20-year build out. Robinson says the intermodal component expects to open with a capacity of 500,000 lifts annually. Forsberg says BNSF locates its intermodal facilities close to major distribution hubs in the nation, such as Memphis, Tenn., Chicago and the Dallas-Fort Worth area. A nearby logistics park is also vital to a successful intermodal project. One of the company’s intermodal hubs is located north of Fort Worth, where the intermodal component is a smaller part of a large logistics industry business park. “It has attracted a lot of distribution facilities and created thousands of jobs,” Forsberg says. For officials of the West Central Ohio Port Authority, a certified megasite along its 94-mile short line rail line is creating economic development opportunities. The rail line runs through five counties on the west side of the state, based in Clark County, located between Dayton and Columbus. The authority has invested more than $4 million in the rail infrastructure during the past few years and aims to continue improvements, such as raising speeds. RailAmerica provides services on the authority’s lines, which offers connections to the CSX and Norfolk Southern lines. At this time, part of an Ohio certified megasite in Fayette County is operational. The site is owned by Blue Grass Farms, an international container shipper, dealing primarily in soybeans, as well as other ag-related crops. The company was expected to begin shipping from the site in the first quarter. Adjacent to that development is another megasite, says Zach Balassone, secretary/treasurer, West Central Ohio Port Authority. The site features full infrastructure and utilities. Balassone adds that although the authority’s rail line moves 90 percent ag-related products, there is an abundance of capacity on the line to move other products. Some distribution operations have been struggling with the shift in flow from international to domestic. While the percentages will flow back and forth over time, tenants at the Logistics Park Kansas City will be able to capitalize because they have the opportunity to receive both, notes Patrick Robinson, executive director, The Allen Group. Oregon City is located on the “outskirts of the agriculture hub of the region,” Underwood says. “We can move products to the Pacific Northwest, the nation or internationally with ease.” City officials support the efficient movement of goods by focusing on enhancing the logistics industry cluster, such as improving the city’s transportation infrastructure. What’s more, Oregon City features available facilities that are ideal for use as distribution centers, and which are situated near Interstate 205, which connects to Interstate 5. Interstate and rail assets in Benson, Ariz., located outside of the Tucson and Fort Huachuca marketplaces, is garnering the attention of distribution firms. The Benson area is home to the San Pedro and Southwestern Railroad short line, which connects to the Union Pacific line. Economic development officials are working with land owners of properties that adjoin the rail line to establish a transload facility, says George Scott, director, Southeast Arizona Economic Development Group. “In the next six months there will be something to look at,” Scott says. Moving north and east to North Carolina, officials in Duplin County are aggressively promoting their transportation assets to industry. Many of the distribution companies located in the county are agricultural based, transporting grain or animals. “We are situated in the middle of major distribution points in the state,” says James Wolfe, executive director, Duplin County Economic Development Corp. The county, located in southeastern North Carolina, is served by the CSX main line, Interstate 40, and is less than an hour from Interstate 95. The community is also an hour’s drive from the North Carolina Global Transpark in Kinston; and an hour-and-a-half drive from the Raleigh-Durham and Chapel Hill areas, Wolfe adds. “We also have several sites and large warehouse sites available that would fit logistics, as far as a headquarters or base operation,” Wolfe says. In southwest Johnson County, Kan., Riederer says because the county is located outside of the urban core of the Kansas City metro, there is plenty of room for distribution companies to expand. In addition to the developing Logistics Park Kansas City, the county is home to the New Century AirCenter and the Midwest Commerce Center. “New Century has 4 million square feet of industrial space, with some food production companies, printing companies and a grain company,” Riederer says. New Century also has a short line railroad, which can move smaller loads of one to five rail cars. The Considerable Options of Prince George, B.C. Located in the center of British Columbia, Prince George saves a significant amount of time moving goods between Asia and the heartland markets of the United States. “We have routes that are quicker from certain locations in Asia to certain locations in North America,” says John Gibson, president and CEO, Prince George Airport Authority. “They are shorter routes than the traditional Anchorage and Fairbanks [Alaska] locations.” He adds the airspace is uncongested and arriving aircraft can fly out in one hour and 15 minutes. Located at the intersection of highways 16 and 97, Prince George is eight hours from the Port of Prince Rupert, says Heather Oland, acting CEO, Initiatives Prince George. “We have a considerable opportunity for back haul operations with respect to seafood from the Port of Prince Rupert, and the local agricultural products,” Oland says. The port is the fastest growing and deepest in western North America. Prince George is also home to a Canadian National Intermodal and Distribution Centre. The airport authority is developing a technical stop and refueling component at the airport. A cargo facility will be complete by the end of the year. It will expedite the transfer of freight from road to aircraft. “The airport also features 600 acres within the fence, and 3,000 acres outside of the fence, which are available to private developers,” Gibson says. For complete details on the logistics opportunities in Prince George, visit www.initiativespg.com and www.pgairport.ca.